His friends – and that’s about everyone – call him Chip, but Bethel’s pastor was born George C. Hammond in a New Jersey suburb across from New York City. His family sometimes went to a Roman Catholic Church, but the message never took hold. By age 12, Chip decided he was an atheist. How does that work in real life? At 16, he realized that if there is no God, there’s no way to say what’s right and wrong. Basically everything is OK as long as you don’t get caught; does that make an act really wrong, or just not acceptable to society? By the time Chip was 18, he was both exhilarated and frightened by the implications of “if there is no God.” That’s an enormous “if.” What if there is a God? That fall Chip enrolled at William Paterson University and took the required Introduction to philosophy. The class was organized around one question: “Does God exist?” To answer this question, students read the works of philosophers who wrote both for and against the existence of God. The final exam for this class had only one question: Does God exist? The exam made Chip realize he was no longer an atheist. The good news – the gospel – had broken through his mind and into his heart and had given him peace with God. “It is by grace you have been saved, through faith, and not of yourself; it is the gift of God so that no one may boast before him” (Ephesians 2:8-9). To his delight he found that being graciously accepted by God meant his life began to change to conform to God's Word. When Chip returned to college at William Paterson, he visited the director of the InterVarsity Christian Fellowship and told him that he recently had become a disciple of Jesus. The director asked Chip to lead a campus group Bible study! There he was, a Christ follower of all of about four weeks, teaching the Bible to others. He felt completely out of his depth. He stayed at William Paterson for one more year leading the student Bible study, and then transferred to Nyack College, a Christian liberal arts college in New York, so that he could add Bible and theology to his academic curriculum. After graduation, Chip joined a church in New Jersey that was pastored by Frank Valeriano, a man who taught him the practical outworking of all the theology he had learned in the classroom. Chip grew immensely under his ministry. While there he worked in sales for an aerospace engineering company but felt unfulfilled. A friend told him about a small Christian college in New Jersey that was looking for an admissions director; he applied for the job, and jumped at it when it was offered to him. Chip enjoyed working for the college. His job included being a guest speaker for vacationing pastors. He discovered that he had both the ability and a liking for teaching the Scriptures. Within two years he moved to Philadelphia to begin studying at Westminster Theological Seminary. He graduated from there in 1992 with a master’s degree in divinity and was called to pastor Bethel Church the following year. He and his wife Donna moved to Leesburg and started a family with their first three children. In 2001 his youngest daughter was born. The seizures would be the first indication that Rebecca would have intellectual disabilities, but until she was a bit older the Hammonds did not realize how severe the disabilities would be. The book is available at Westminister Theological bookstore and other book distributors. For the next nine years Chip wrestled with this question. In 2010 he enrolled in the doctor of ministry program at Gordon-Conwell Theological Seminary and attended the Charlotte campus. His research led him through the historical and modern perspectives on the Imago Dei and the practical implications to families and churches ministering to those with severe intellectual impairments. 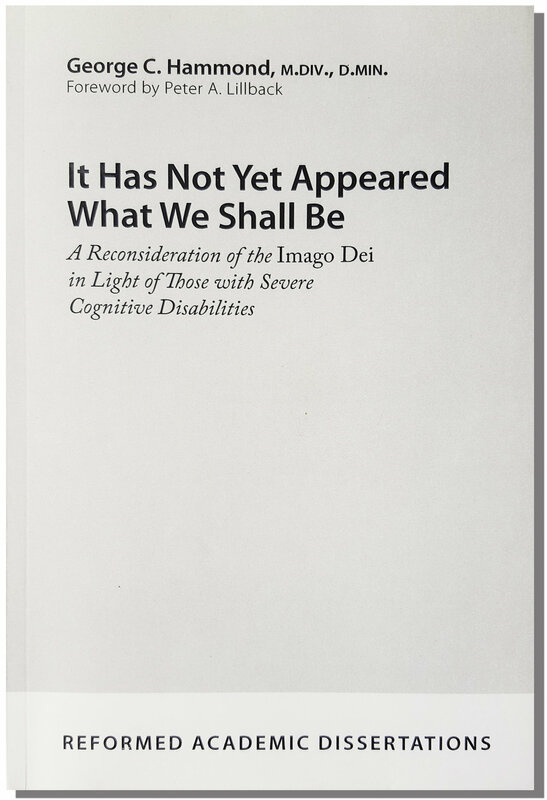 In May 2014, Chip graduated after completing his dissertation: It Has Not Yet Appeared What We Shall Be: A Reconsideration of the Imago Dei in Light of Those with Severe Cognitive Disabilities. Chip’s work proved a blessing and encouragement to families with members who had intellectual disabilities, as well as to pastors seeking to minister to such families. His work was noticed by P&R Publishing, and with minor modifications his dissertation was published as a book in the fall of 2017. In addition to his work for the intellectually disabled, Chip has contributed to publications like Westminster Theological Journal and New Horizons, and to secular periodicals. He has served the community as senior chaplain of the Leesburg Police Department. For more than a decade he served as chairman of the Candidates and Credentials Committee of the Presbytery of the Mid-Atlantic. He currently serves on the Committee of Home Missions and Church Extension. The expansion of Christ’s church and the blessings of the gospel have always been important to him. In 2000 he began meeting with residents of western Loudoun County, preaching on Sunday mornings in the Round Hill Municipal Building. This work eventually grew into Ketoctin Covenant Presbyterian Church, a work which continues to flourish in Purcellville. In 2015 Chip was appointed as a Teaching Fellow with the C.S. Lewis Institute’s Fellows Program, a program which seeks to disciple and equip God’s people across denominational lines for spiritual growth, solid commitment to Christ, and service to the local church. Chip and his wife Donna are on the cusp of being empty-nesters. When not preaching, teaching, writing, or studying, he enjoys listening to jazz and playing drums with other musicians, and working with his hands.